Enjoy engaging, being involved, and making a contribution. But equally as stimulated, creating in my own space. 'Nothing is good where better is possible' - the old Welsh saying defines me in a way, but at the same time can be a curse. When will I learn to be content and 'live in the moment'? Yes, In the sub-head of my blog, I am indeed drawing parallels to the eccentric, quintessential traveller in Graham Greene's novel "Travels with my Aunt". I laughed so much when I saw the comedy with Eddy in a West End theatre in London in the early 90's. Wikipedia says " . . . the retired Henry Pullingcock finds himself drawn into Aunt Augusta's world of travel, adventure, romance and absence of bigotry . . ." O, for the romance bit! 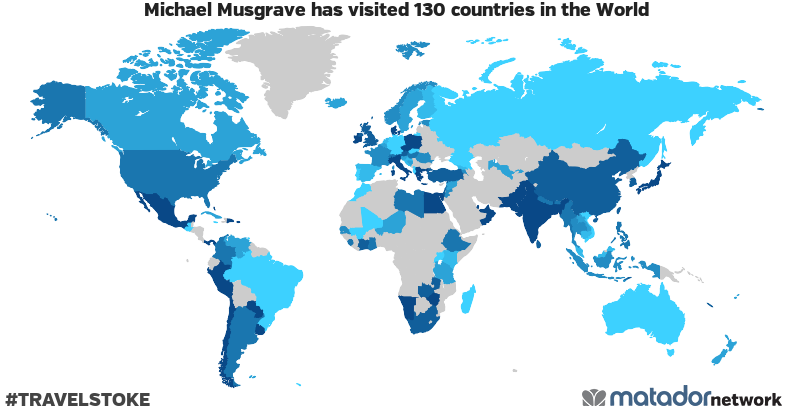 Michael Musgrave has been to: United Arab Emirates, Albania, Armenia, Argentina, American Samoa, Austria, Australia, Bosnia and Herzegovina, Barbados, Bangladesh, Belgium, Bermuda, Brazil, Bahamas, Bhutan, Canada, Switzerland, Ivory Coast, Cook Islands, Chile, People's Republic of China, Colombia, Cuba, Cape Verde, Czech Republic, Germany, Denmark, Dominican Republic, Estonia, Egypt, Spain, Ethiopia, Finland, Fiji, Falkland Islands, Faroe Islands, France, United Kingdom, Grenada, Georgia, Ghana, Guadeloupe, Greece, Guatemala, Hong Kong, Croatia, Hungary, Indonesia, Ireland, Israel, India, Iceland, Italy, Jamaica, Jordan, Japan, Kenya, Cambodia, South Korea, Laos, Lebanon, Liechtenstein, Sri Lanka, Luxembourg, Libya, Morocco, Monaco, Montenegro, Madagascar, Macedonia, Mali, Myanmar, Macao, Martinique, Malta, Mauritius, Maldives, Mexico, Malaysia, Namibia, New Caledonia, Niger, Netherlands, Norway, Nepal, New Zealand, Oman, Panama, Peru, French Polynesia, Philippines, Pakistan, Poland, Puerto Rico, Palestine, Portugal, Paraguay, Qatar, Romania, Russia, Sweden, Singapore, Slovenia, Slovakia, Sierra Leone, San Marino, Senegal, Syria, Thailand, Tibet, East Timor, Tonga, Turkey, Trinidad and Tobago, Taiwan, Tanzania, Uganda, United States, Uruguay, Uzbekistan, Vatican, Venezuela, U.S. Virgin Islands, Vietnam, Vanuatu, Wallis and Futuna, Samoa, South Africa, Zambia, Zimbabwe.